We give quality a very real meaning: "All that thoroughly satisfies professional users' expectations and needs, and makes our product a key working tool". 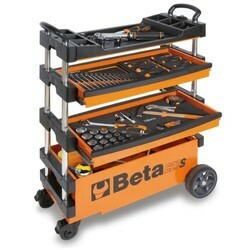 The tool is designed and built on the basis of state-of-the-art technology, to perform its more general function, while providing unique repeated performance in time. 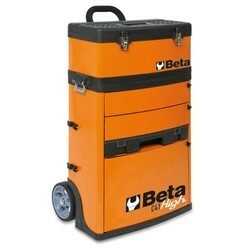 - Tote-trays and holes for accommodating screwdrivers. - Convenient "V" groove for working pipes and sections. 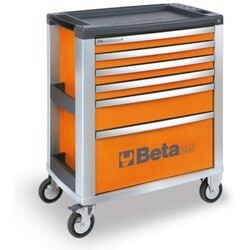 - Quick release system made of fibreglass-reinforced nylon, opening throughout length of drawer. - Corner bumpers throughout height of roller cab, to avoid damaging vehicles in garage. - Drawer bases protected by foamed rubber mats. - Front centralized safety lock. 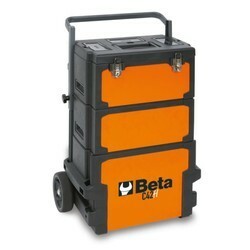 - Static load capacity: 1000 kg. - Built-in side bottle and paper holders, adjustable in several positions. - Sheet metal frame and plastic tops, synonymous with remarkable sturdiness and reduced weight. - Oversized castors (160 mm), built into frame for easy transport - for example, on steps. - Side centralized lock for closing drawers of lower module. - Drawers with ball bearing slides and double closing hook. - Sheet metal frames and plastic tops, synonymous with remarkable sturdiness and reduced weight. - Oversized castors ( 160 mm).